BMO Field was built to provide Major League Soccer expansion team Toronto FC with a soccer-specific home and to serve as the flagship venue of the 2007 U-20 FIFA World Cup. It was Canada’s first soccer-specific stadium. 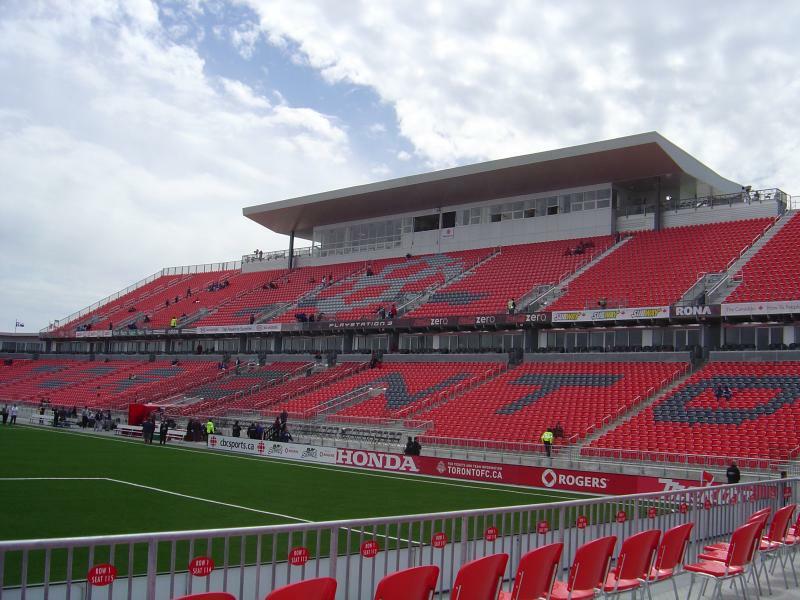 BMO Field officially opened on 28 April 2007 with a league match between Toronto FC and the Kansas City Wizards (0-1). From 2014 to 2016, the stadium underwent a large redevelopment, including the construction of an extra tier over the East Stand, additional hospitality facilities, and the erection of a roof over the entire stadium. This raised capacity with 8,400 seats to a total of 30,000 seats. The expansion came at a cost of CAD 120 million. 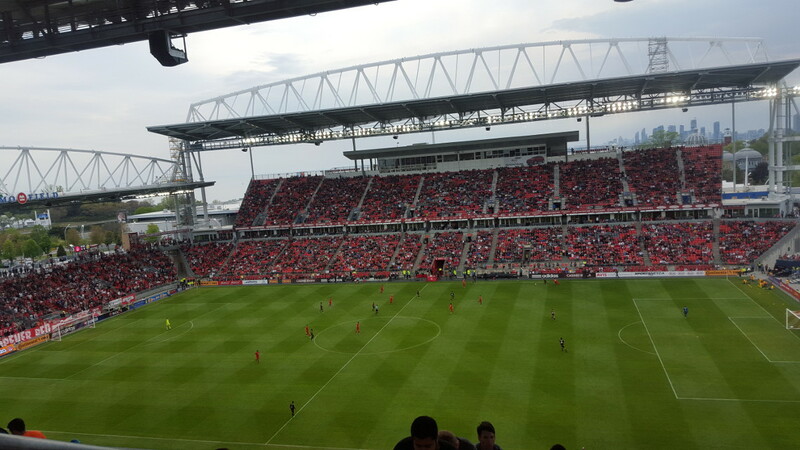 BMO Field is located on the waterfront of Lake Ontario, about 3 kilometres west of downtown Toronto, the CN Tower and Toronto Union Station. The stadium lies on the grounds of Toronto Exhibition Place and is bordered by the Gardiner Expressway to the north. If coming from the Gardiner Expressway east, take the exit for Lake Shore Blvd/Jameson Ave. Follow Lake Shore Blvd for about a kilometre and turn left onto Ontario Drive and the Exhibition Place grounds. From the Expressway west, leave for Lake Shore Blvd and either enter the Exhibition Place grounds at Newfoundland Road or Ontario Drive. BMO Field lies a short walk away from GO train station Exhibition, which is one stop west from Toronto Union Station on the Lakeshore West line. Trains leave about once an hour for the 5-minute journey. Alternatively, you can take tram (streetcar) 509 from Union Station. Take the tram westbound to the Exhibition Loop. Trams run multiple times an hour. From Bathurst Metro Station (not far from the University of Toronto campus) you can take tram 511 southbound to the Exhibition Loop. Tickets for Toronto FC matches can be bought online via Ticketmaster, by phone +1 416 360 4625, or at the BMO Field Ticket Office. On the day of the match the ticket office is opened for ticket sales until the start of the second half. Ticket prices depend on the opponent, but expect to pay CAD 20.00 for a general admission ticket, CAD 50.00 for the cheapest assigned seats behind the goal, and between CAD 55.00 and CAD 339.00 for a seat at one of the sides. Torontofc.ca – Official website of Toronto FC. Seetorontonow.com – Toronto tourist information. Gotransit.com – Information on the Go Train transport system. TTC.ca – Toronto public transport information. Just an update….those Lakeshore West trains in your review now run every 30 minutes to and from the Exhibition station. A no-frills, bare-boned stadium. The stands are metal, and have the feel of a giant erector set. The vast majority of seats are uncovered, which can be problematic in the spring or the fall. However, the site lines are excellent, and the club invested in a real grass pitch a couple of years ago, replacing the original artifical turf. Located close to downtown, it isn’t hard to get to. 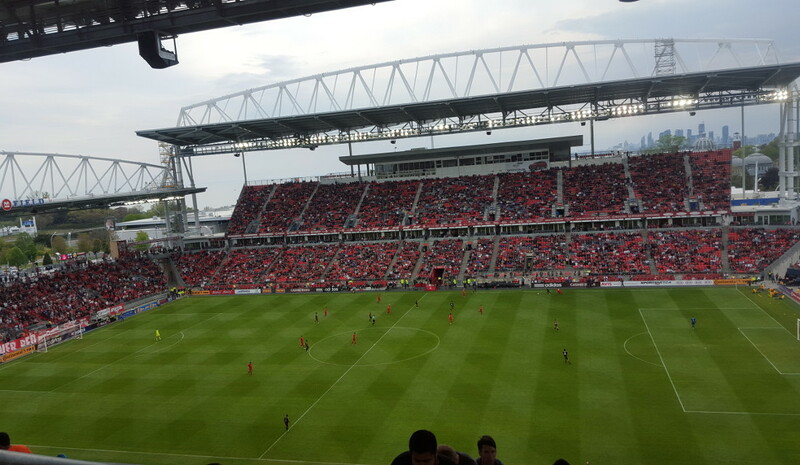 Overall, BMO Field is not a bad place to watch a match, with a good atmosphere and enthusiastic fans. I have never had any problems bringing my young son to games.